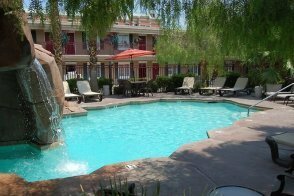 Conveniently located near McCarran International Airport and across the street from the popular Hard Rock Hotel & Casino, the Red Roof Inn hotel is designed to please vacationers and leisure travelers alike. That's because it's situated within walking distance of the world-famous Las Vegas Strip. 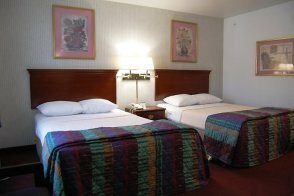 The Red Roof Inn boasts 199 comfortable rooms. Attractively decorated, each one comes with a host of amenities -- including a cable TV, a desk and a kitchenette with a microwave, stovetop, sink, small fridge and coffeemaker. 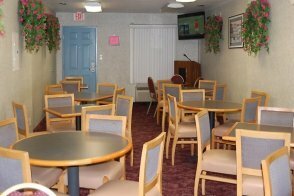 Guests will enjoy free wireless internet access, local calls and weekday newspapers. 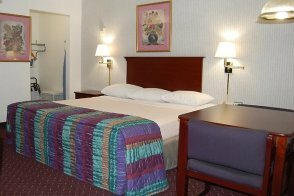 Both smoking and nonsmoking rooms are available. The staff at the hotel is friendly and helpful. Each morning guests will be greeted by a complimentary breakfast featuring eggs, yogurt, fresh fruit, cereal and waffles. There's a lovely outdoor heated pool that is bordered by a rock grotto-style waterfall. It's open year round. 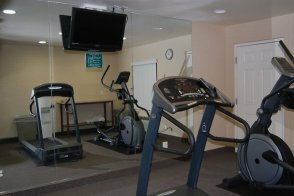 A fitness room is stocked with a variety of weight machines and cardio equipment. 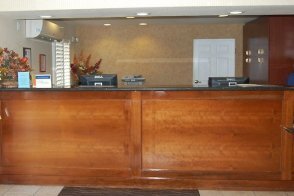 For added convenience, valet cleaning services and laundry facilities are offered on the premises. All of the major attractions of Las Vegas are in the vicinity. Megaresorts like Planet Hollywood Resort & Casino and The Cosmopolitan as well as the CityCenter urban complex are a few blocks west. Similarly, the University of Nevada, Las Vegas is just a few blocks east of the hotel. About a mile away, shoppers will delight in the Fashion Show mall and The Forum Shops at Caesars. Several golf courses are located less than five miles away, including the TaylorMade Golf Experience and the South Seas-themed Bali Hai Golf Club. Plus, hiking, rock climbing and other outdoor recreation can be found about 25 miles away at Red Rock Canyon National Conservation Area. 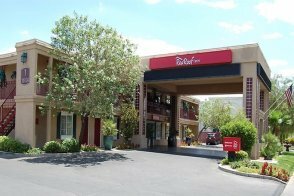 The Red Roof Inn is perfect for guests who prefer a quieter atmosphere but still want all of the excitement of Las Vegas at their fingertips. No, but a free complimentary breakfast is available each morning. There are also numerous restaurants within walking distance. No, but there are several bars and nightclubs across the street in the Hard Rock Hotel & Casino. No, but guests are just a few blocks away from the Las Vegas Strip. No, but guests will have access to copy and fax services. There is a meeting room that can accommodate up to 75 people. Yes, there is a $25 per night fee and pets must be under 15 pounds. Maid service, wake-up calls, guest laundry, valet cleaning service and free hot breakfast. No, but there is space in a self-parking lot. The maximum total number of guests (adults and children) in a room is four. A government-issued photo ID is also required at check-in. 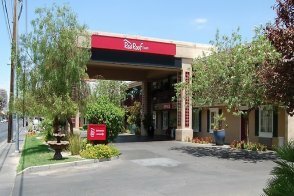 Resort fee Red Roof Inn does not have any resort fees. This 230-square-foot room comes with two queen beds. It has wood furnishings, including a work desk. There is a kitchenette complete with a microwave, stovetop, refrigerator and coffeemaker. This is a nonsmoking room. This 230-square-foot room comes with one king bed. It has wood furnishings, including a work desk. There is a kitchenette complete with a microwave, stovetop, refrigerator and coffeemaker. This is a nonsmoking room.